Chalet Clementine offers skiing luxury in Oz en Oisans part of Alpe d'Huez area. The chalet is part of an exclusive development of 33 detached chalets tucked away in a quiet corner of Oz en Oisans, part of Alpe d'Huez ski resort, at 1350 metres. There is an entrance hall on the first floor with ski and boot rack and plenty of hooks to hang your coats. This leads to a large open plan room with fireplace. Two patio doors lead onto a balcony which we have extended to run around two sides of the chalet and offers a great space to sit, with wonderful uninterrupted mountain views. At the other end of the room is a large dining table seating 10. Round the corner there is a kitchen from which double patio doors provide another access to the extended balcony which has outdoor seating and a table which seats six comfortably and offers more wonderful views. On the ground floor are three bedrooms and from the lounge, steps lead to a fourth mezzanine bedroom, with restricted height at one end. The resort of Oz en Oisans, which is part of L'Alpe D'Huez Grande Domain is particularly suited to families, with most of the village pedestrianized and peaceful. The chalet is perfect for both winter and summer holidays. Oz en Oisans is a quiet resort, but with a fast ski lift connection to Alpe d'Huez and Vaujany offers great access and a huge ski area to explore. in the summer during July and august the resort of Oz en Oisans comes alive again providing a fantastic summer family experience. About the owners We are an English couple who have been skiing in and around Oz for over ten years. We purchased Chalet Clementine in 2014 with the aim to provide our guests a luxury self catering chalet for them to relax and enjoy a comfortable stay in the resort, whilst enjoying all the outdoor activities Oz en Oisans and the surrounding area of Alpe d'Huez Grand Domain have to offer. We spend the winter and summer seasons in Oz, so we will normally be onsite to personally welcome our guests. When required we use the services of a local multilingual person to greet our guests out of season. This is the only rental property we own in France so it is very much a labour of love. We have extensively upgraded the furnishings and kitchen in the summer of 2014, installed stairs to access the drag lift in 2015 and extended the balcony in 2016 and plan further improvements to the mezzanine area in 2018. We have four children who love the outdoor life Oz en Oisans offers, whether it is winter sports or summer activities. The Oz / Alpe d'Heuze resort provide the perfect backdrop for a mountain holiday. Alpe d'Heuz is large enough to offer all the skiing terrain you need but Oz is small enough to retain a relaxing safe family atmosphere. Oz has a supermarket, restaurants, sports shops, bars, a heated indoor swimming pool and a spa area with whirlpool, sauna and steam room, a climbing wall and an outdoor ice-rink in the winter. Oz is a charming family resort nestled at 1350m in the heart of Alpe d'Huez Grand Domaine Ski, Oz has all the charm and authenticity of a family resort. We hope you enjoy staying at our chalet as much as we do living in Oz. The property is located only 20m from the Clos du Pre drag lift, which can now be accessed by a short flight of steps, so it is a virtually ski in ski out location. It is close to the Moontain Hotel which has a bar and restaurant and only a short distance to the resort centre where you can find a supermarket, more bars, restaurants and shops. It is not suitable for the elderly or anybody with mobility restrictions, but is perfect for families who want to be based in a safe environment, offering stunning views and facilities to provide both a little apres ski and home family comfort. We allowed our children to spend most of their time on the baby slopes and toboggan run with minimal supervision both during the day and early evening. Vehicle access terminates at the edge of the village, so the resort is essentially pedestrian only. On the first floor there is a toilet. On the ground floor there is another toilet, a separate shower room with basin, cupboards and heated towel rail and a separate bathroom with bath and overhead shower, heated towel rail and basin with cupboards. Underfloor heating suplimented by wall heaters. Bed Linen is normally included. Real fire available. Logs supplied for first fire along with firelighters. One car parking ticket for the covered multi storey car park is provided. Free WiFi available via Orange Livebox. The living room contains a sitting area with two large comfortable sofas, a coffee table, flat screen UK satellite TV, CD and DVD player and numerous games. Free Wi-Fi is available at Chalet Clementine. Under worktop Refefrigerator with small ice box. There is a full size dishwasher, full size oven with extractor hood, hob, fridge/freezer, filter coffee machine, toaster and microwave. Dining table seats up to ten persons. French HD digital TV available. Boom box with bluetooth connection to iphone or other bluetooth compatible device available. Bring your own tunes! A DVD player is available in the lounge and also in one of the bedrooms. Lac du Verney offers canoes, paddle boats. A range of mountain and road bikes may be rented in the resort during the summer. Lac du Verney offers many aqua sports. The Terrace was extended this year (2016), and wraps around two sides of the chalet. It has a table and chairs as shown in the photograph, and provides stunning views of the Belledonne mountain range. Skiing Oz connects directly to Alpe d'Huez Grand Domain which is popular with both skiers and snowboarders. There are a wide range of slopes to satisfy beginners through to advanced skiers. A ski school is in the village. There are over 250 kilometres of runs, including the Sarenne black slope, the longest run in the world. Starting from Pic Blanc (3,330m), it continues on and on, down to the Gorges de Sarenne (1,510m) for 16 kilometres. Oz-en-Oisans / Vaujany (1,135m - 2,800m) 22 lifts 660 snow canons 75 km of skiing on 41 ski runs: 12 green runs 14 blue runs 12 red runs 3 black runs Alpe d’Huez Grand Domaine Ski (1,135m – 3,300m) 80 lifts 918 snow canons 250 km of skiing on 135 ski runs : 42 green runs 37 blue runs 39 red runs 17 black runs There is a drag lift at the back of the chalet and when conditions allow, it is possible to ski directly back to the chalet There are nursery slopes in the village itself as well as at the higher stations. A swimming pool is available in the resort. Notes on accommodation: The chalet is heated by underfloor heating which is supplemented by electric wall heaters and an open fire. There is also a travel cot and high chair, although cot bedding is not provided. The bedroom on the mezzanine floor is accessed by a set of steep stairs and may not be suitable for everybody. Outside: There are two balconies, one of which is provided with an outdoor table and chairs and a barbeque. Utility Room: The property has a washing machine, vacuum cleaner, iron and ironing board, two drying racks and a hairdryer. Cleaning / Towels / Linen / Maid service: PRICE INCLUDES HEATING, CLEANING and TOURIST TAX. Price normally includes supply of bed linen and towels but we reserve the right to add an additional charge @ £6/7€ pppw for towels and bed linen @ £14/18€ pppw if we are not present to service the chalet ourselves. Magic skiing, sledging & huskies in Oz! We have just returned from a wonderful week at Chalet Clementine (in Oz-en-Oisans, a small, family-friendly resort with easy access to the large Alpe D'Huez domaine): it was all perfect; from the mountain views, the wood-burning stove, the boot racks/cupboard, plenty of hot water and easy access to the slopes, lifts and local amenities. We even managed a sled ride pulled by eight huskies in Bergers! To top it all, Gary and Jan (the owners, who live nearby) are exceptionally warm and generous hosts. They answered all of our questions in the months leading up to our trip and were on hand throughout the week with help and advice. Fantastic holiday. Chalet is very comfortable and well equipped (kettle, tea pot, propper cups, olive oil, salt/pepper and cleaning products). Kids loved the upstairs bedroom. The Poma tow is very close to the chalet for skiing in/out. Gary made us very welcome and was the perfect host, always very good to have inside information on where to eat and ski! The welcome basket was a generous addition and so was the wine! Huge thanks for a great week - hope to be back soon. This is our second visit to Oz en Oisans and our second visit to this set of chalets, our previous stay had a chalet lower down the slope and nearer the trees on the left so the views weren't great and there was no evening sun. Chalet Clementine however offered the perfect position for us as it looked out over the trees giving a wonderful view of the mountains opposite and if you are so inclined you could get the sun all day in this spot until it sets behind the mountain opposite, great if you like to chill in the evening with a glass of wine. Access to the chalet was good as the steps to the road are right next to the chalet, unloading and loading the car means parking above the chalet and navigating the steps which are steep but there is a longer less steep path that is easily accessible for larger bags. The chalet itself was modern, clean, well maintained and with everything we needed for our two week stay in this great little village, it even had a TV so we could watch the Tour de France after we had been cycling ourselves. If you are cycling in the area the climb to the village is testing, especially if you've already done it half a dozen times, so you might want to park down at Lac du Verney to avoid it if doing some of the longer steep routes in the area. On that point this is the ideal location for exploring the famous local climbs such as Alpe D'Huez, Col D'Ornon, the Col du Glandon and the Col de la Croix de Fer, you really are spoilt for choice around this location. I have no hesitation in recommending this location and chalet, the icing on the cake for us was the warm welcome from the owner who met us when we arrived and was most helpful with advice for the village and area, even offering to help us with our bags. Just got back from a wonderful and memorable week’s skiing, staying in Oz in the idyllic Chalet Clementine. Gary and Jan we’re so generous with their time and hospitality upon arrival. They couldn’t do enough to help. The chalet was perfect! Clean, spacious, comfortable, lovely and warm, picturesque and next to the slopes! Had a fantastic week and could not recommend highly enough! Thank you for choosing to stay with us and for taking the time to leave such a lovely review. We are so glad you enjoyed your stay and that Chalet Clementine met your expectations. We would would welcome you back anytime. Where do I start?....We stayed in Chalet Clementine over the New Year and had the most fantastic time. From our initial booking Gary & Jan have been so helpful and always provided fully comprehensive answers to my endless questions. No question ever seemed too much trouble to answer. Gary gave advice on ski passes, transfers, ski hire...you name it, he helped us out with it. We booked everything through his recommendations, and it all worked out perfectly. Gary met us on arrival and showed us around the chalet, telling us how various things worked etc. He then took us all up into the village and showed us where the supermarket was, various restaurants, the tourist info and ski hire etc. We were 2 families of 4, and found the chalet was great for us. It is so beautifully presented and has such lovely homely touches. It feels so warm & cosy too; especially with the fabulous log fire roaring away. (Logs were provided free by the owners) The cupboards in the kitchen are really well stocked and have every type of pot/pan/dish/kitchen appliance you could possibly need. We cooked ourselves and ate in nearly every night, and sat round the huge dining table to eat our meals. There were board games, a great selection of DVD's and books, TV with English channels, if we needed them. To be fair though after a tiring day of skiing and hearty meal, we were in bed for 9 exhausted! Whilst on the subject of beds;,all 4 bedrooms were lovely. Really comfy beds.They all had 2 single beds, a wardrobe and bedside cabinets. There was a large cupboard in the entrance hall which we found handy for ski boots and ski's, and plenty of coat hanging. 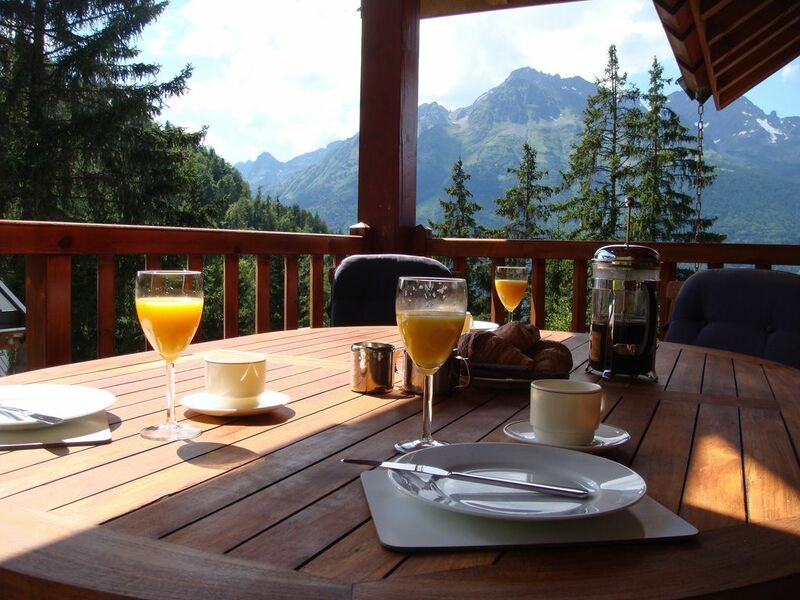 The location of the chalet is just fantastic, the view from the chalet has uninterrupted views of mountains. Waking up and looking out to that scenery was breathtaking. We found Oz was a perfect base for us, a quieter village away from the larger resort of Alpe D'huez, yet a 15 minute gondola ride and you could access the huge ski areas of Alpe D'Huez. Oz and Vaujaney. For us, the Alpe D'Huez ski area was the best resort we have ever skied in. It literally catered for everyone. I was happy skiing all day on the lovely wide gentle green and blue slopes, whilst my boys were off on the red and black runs.Snowfall was incredible. I can highly recommend this chalet, it really was just a perfect holiday in a beautiful area and without doubt we will be back. Thank you so much Gary & Jan for letting us stay in your amazing home. This has been our 2nd visit to Oz and the 1st to Chalet Clementine. We are a group of mixed cyclists who have a bucket list of Cols to explore and demand a high standard in accommodation in our advancing years. Chalet Clementine and the resort of Oz are highly recommended for those wanting a quiet relaxing summer holiday in a beautiful tranquil setting with truly stunning views. Chalet Clementine is as described. Comfortable, clean and very well equipped with everything necessary for an enjoyable stay. Particular attention to small details make this chalet stand out above others we have used.The hosts, Gary and Jan, were proactive and very responsive to answering questions before our arrival, they were on site to welcome us, help us with a few questions during our stay and bid us farewell at departure. They helped make our stay that much more enjoyable. We would recommend this chalet to anybody wanting a bit of comfort at the end of an active day. Jan and I would like to thank you for choosing to stay with us and for taking the time to leave such a complimentary review. We hope your legs recover and would welcome you back any time. Oz has a supermarket, restaurants, sports shops, bars, a heated indoor swimming pool and a spa area with whirlpool, sauna and steam room, a climbing wall and an outdoor ice-rink in the winter. Cable cars access high altitude lakes, glaciers, flora and fauna in a protected environment. There are many cycle paths varying from easy routes through the valleys to various grades of mountain bike trails. Bikes can be hired in the village. Grenoble bus station is served by buses from Grenoble and Lyon St Exupéry Airports. Every Saturday in winter, direct buses go to Oz Station. Booking Notes: There are normally no additional mandatory charges. To reserve the property clients can book via Homeaway website. Once the deposit is credited the booking is secured. The balance is due 4 weeks before the rental commences. Bed linen and towels will be supplied, but we reserve the right to add a cost if we are not present to service the chalet ourselves. We do not impose any cleaning charges, but ask guests to respect the chalet and perform some basic tasks at departure. If you are interested in booking the property please send details of your address and the ages of any children aged 16 and under in your party and we will send out a booking form for you to complete. Changeover Day: The changeover day is normally Saturday during the winter and summer main seasons, but we are willing to consider specific timings outside of these dates. The chalet can be accessed from 16:00 and we ask that guests leave by 10:00 on the day of departure. Notes on prices: All prices can also be quoted in Euros. We will accept payment in either Euros or sterling. There is normally a 300 Euro or £300 security deposit which can be paid in advance or upon arrival. This is fully refunded within 7 days of the holiday, assuming there is no damage, or loss of keys.